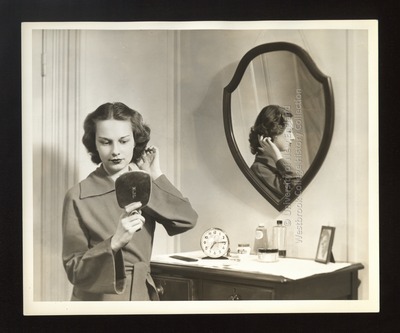 A Westbrook Junior College student holds a hand mirror and stands at her dormitory room dresser in this black and white photograph by Jackson-White of Portland, Maine. She wears a long-sleeve bright wool dressing gown tied at the waist. The young woman holds the hand mirror in her right hand and primps her hair with her left hand. This activity is reflected in the wall mirror over the dresser. On the top of the dresser is an alarm clock, a photograph, a comb and cosmetics.